STAYING IN THE confines of the Oireachtas private members’ bar saves TDs and senators at least 65 cent a drink. 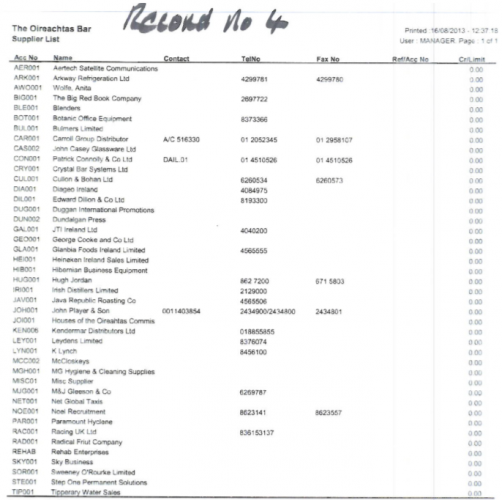 The price list below is part of a Freedom of Information request by TheJournal.ie, which sought to get more information on the bars in the wake of the abortion debate in July. The bars provides drinks at rates much cheaper than its nearest neighbours. Within the surrounds of the private members’ bar, a pint of either Guinness or Smithwicks costs just €4.30. That is compared with €4.95 in the bar in Buswells Hotel, a mere stone’s throw from the front gates of Leinster House. Up the road in the Shelbourne Hotel, an Oireachtas member wouldn’t be able to quench his thirst for the black stuff for less than a fiver, with a pint coming in at €5.75. For lager drinkers, at least 40 cent is saved, with a pint in the Dáil coming in at €4.70 in the Oireachtas, but €5.10 in Buswells and €5.95 in the Shelbourne Hotel. Bottles of beer come in 30 cent cheaper than many places at €4.70. Red Bull drinkers receive a discount on most city centre pubs, with prices ranging between €4 and €5 in most Dublin pubs and clubs. In the Oireachtas bars, the energy drink costs just €3.20. However, no members of the Dáil felt the need for wings on the night of the abortion debate: none are listed on receipts for the night. Spirits come in cheaper than many pubs as well, with glasses of scotch, gin, rum and vodka coming in at €4.10 and whiskey at €5. Wine, however, is on the expensive side, with a small bottle costing €5.50. Members need not only be content with each others company, the below suppliers list shows Sky TV listed as a supplier. The suppliers list shows that the bar also has Racing UK, a specialist horse racing channel. 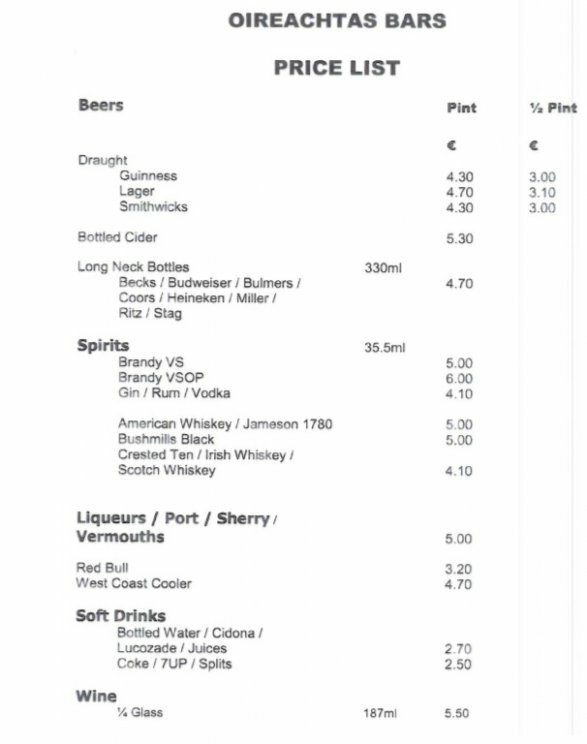 Email “Here's what a drink costs in the Leinster House bars”. Feedback on “Here's what a drink costs in the Leinster House bars”.